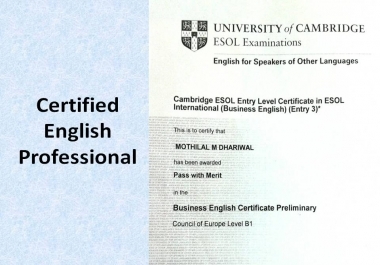 ***English Professional Certified by University of CAMBRIDGE.....!!! *** Need someone to write Original content..?? Needs to be compelling and flawless?? Hi. You just found the right guy for your work. I can write original and creative articles that are sure to boost your online presence. I even write essays and assignments or any other type of article you want me to write. I will write/translate anything for you including- Poems Songs Scripts or articles Essays or stories Assignments Or anything you want I guarantee you 100% satisfaction with best results. Please contact me before placing your gig. I will assess your requirements and then give an estimate.